Residents of Two Bridges have come up with two plans to slow and manage development in their Lower East Side Neighborhood. Development in the neighborhood has boomed in recent months. In April, JDS Development Group revealed plans for a SHoP-designed 77-story tower, while L+M Development and the CIM Group (Two Bridges Associates) are planning a residential complex nearby. 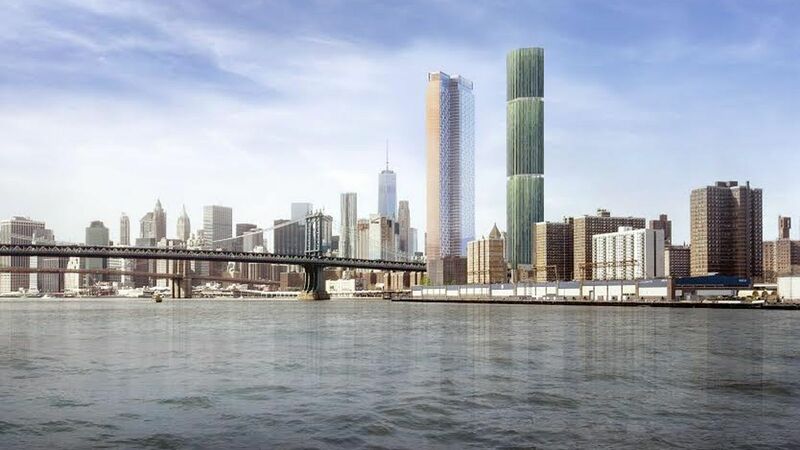 Starrett Corporation may build a 60-story tower on an East River parcel it owns, while Extell Development’s One Manhattan West, an 80-story luxury condo, is expected to be complete in 2019. In light of this unprecedented high-rise explosion, residents and the pols that represent them have advanced two proposals that address the development in their neighborhood. One plan, initiated by the Chinatown Working Group proposes a neighborhood rezoning to cap building heights at 350 feet. It would require residential buildings to offer below-market-rate housing (possibly through MIH). The plan would also mandate harassment certification from potential developers, DNAinfo reports. Elected officials, spearheaded by Councilwoman Margaret Chin, delivered a plan in letter form to the Department of City Planning that suggests skyscrapers planned for the waterfront should not be built as-of-right but should be viewed as “major modifications,” not “minor modifications.” This distinction would trigger a Uniform Land Use Review Procedure (ULURP) process, the months-long back-and-forth between larger stakeholder groups that include the community board, Borough Board, Mayor de Blasio, and the City Council. Chin argues that all four development sites should be considered together for these changes to occur. Residents are concerned that the neighborhood’s existing infrastructure cannot adequately accommodate an influx of new residents. Moreover, the neighborhood’s character could change if more high-rises are built. State Assemblywoman Alice Cancel is calling an emergency meeting of constituents to come up with a plan to stop the developments. The Chinatown Working Group’s plans are being workshopped by the Department of City Planning; the department concluded the plan was too broad and unfocused and is now reviewing three sections of the plan, although there’s not community consensus on this approach. The plan as it’s being revised by DCP emphasizes a rezoning that would encourage the development of more affordable housing via MIH, which is tied to the development of market-rate units.